Some trees yield a sugar-rich sap which can be drunk raw, fermented into alcoholic beverages or gently boiled down to syrup (10 litres sap makes approx. 1 litre syrup). The most copious flow is approximately during the first half of March, with up to 2 litres per day. There also tends to be a greater flow during the day and is best when nights are frosty, and days are warm and sunny. Volume varies with species, as does the sugar content. I have tried Sycamore and Birch sap. Both have a faint sweet taste. Birch sap is slightly astringent. It may also have medicinal value, especially for the urinary system. It is said to dissolve kidney and bladder stones, is good for problems with gout, rheumatism, water retention, renal oedema and cystitis. The common way to tap a tree is to drill a hole in the lower trunk, approximately 30mm deep, angled slightly upwards and the diameter of the tube used (10-20mm) giving a tight fit to prevent leakage. Insert one end of some plastic tube part-way into the hole and the other end into a container, covering the opening with cloth to exclude leaves, insects etc., but allowing air to be expelled as the container fills up. To protect the tree from damage, insert a tight-fitting wooden plug after tapping is complete, sealing any leaks with wax or proprietary sealing compound. Do not tap for more than two days, and tap the same tree every other year maximum. Tap only mature trees. The easy way to tap a tree (thanks, Rob, for this great tip) is by simply cutting, or even breaking off the end of some thin branches. Put the branches into the neck of a bottle, tie the bottle to the branches and gently weigh them down to make sure the bottle hangs in as upright a position as possible. Branches want to point upwards. You can tie a small log or other weight to the branches, tie them to vegetation below or lean a long stick of the right weight onto the branches to make them bend down. There is no need for any sealing after the tapping. The small twigs will heal over by themselves. This method is suitable for any tree where the branches are easy to reach, and can be done on younger trees. I just tried this method, rather late in the season, and with just a few small twigs got about 140 ml birch sap and about 50 ml of sycamore sap in 24 hours. Which Trees Can be Tapped? There are a number of trees which can be tapped for their sap, and many which should not. For example, Willow bark contains salicylic acid, which is the active ingredient of Aspirin, so the sap should not be consumed as a food. Fresh sap can spoil within a day or two (becomes cloudy, sour). Store syrup in an airtight container and place in a cool place. This syrup can become mouldy. To store for extended periods, the syrup should be sterilised. Adding 4-6 cloves and a little cinnamon may help to preserve it longer (this is not something I have tested personally). 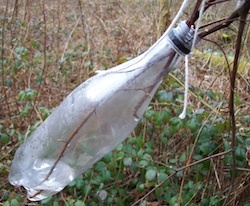 I just came across a great post on the blog TYWKIWDBI (Things You Wouldn't Know If We Didn't Blog Intermittently) about this twig tapping method with more information, and a better way of collecting the sap - with a plastic bag. Check it out here.